Package initscripts is not configured yet. I'm just performing 14.04.1 pre-release testing and decided to try a Saucy -> Trusty upgrade even though Saucy recently reached EOL. I'd expected to be told no upgrade was available (or was impossible) early in the process if it were not possible at this point in time but the upgrade appeared to be in progress until the attached warning appeared (I'd guess about half-way into the upgrade process based on lapsed time) . No idea what will happen on reboot so I wanted to file this prior to reboot. I'll follow up later. This is the message displayed at the very end. 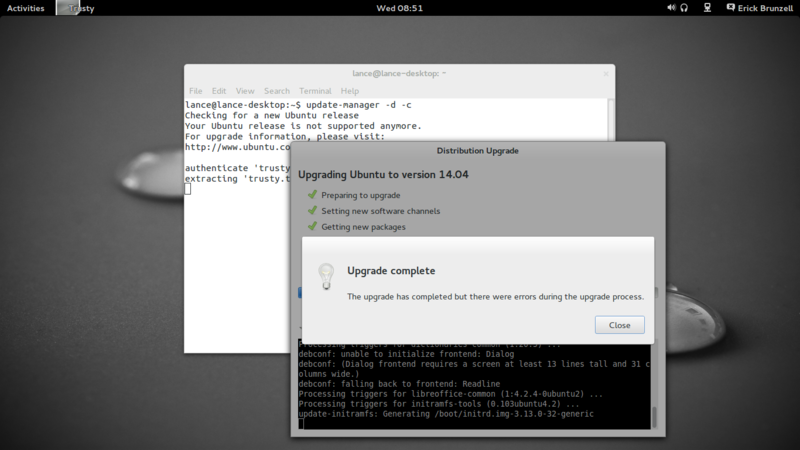 I found that it did not reboot as expected at the end, but when rebooted the system as found was upgraded and viable. Both on 32 and 64 bit. I'm trying to figure out an unrelated release-upgrade bug and stumbled upon bug #1310411 where the kernel did not upgrade - possible duplicate? Package procps is not configured yet. So this probably points to an apt bug. Michael, can you take a look? I just tried to reproduce it locally without much success, I try again tomorrow. There is a dependency loop mountall->udev->procps->initscripts->mountall. When apt tries to deal with it, it configures them all initially together, then it finds the "libplymouth4" dependency of mountall that is not unpacked yet and inserts the unpack at this point wich breaks the condition that all packages in the loop need to be unpacked at the same time. And I just verified that the commit before the offending one (66706285) fully works and upgrades the system correctly. The immediate-configure property is also better honored. Hm, now that saucy is closed, how can I upload a updated apt into saucy-updates that contains the fix? Some more work is needed fo the patch, its eliminating too many case. But the direction is there, the SmartConfigure() is currently trying to configure too much too early when its not really needed. and it worked for those cases correctly. The bug was that apt tried to SmartUnPack packages that were dependencies but did not need action just yet (i.e. where the dependencies of the installed version are fine now and the unpack/configure of the updated version would be hapen in a later stages of the ordering). I also did a precise->trusty->utopic upgrade cycle with the patch (the precise base that triggered #1347964 before) and again all good. For those of us who have been affected by the bug, it would be good to have guidance on whether we need to do a clean install of 14.04 or if there's some other action that should be taken. As some others have reported, my system seems to be working properly, but would like to know if there's some inconsistency I'm not seeing. @Jim - its hard to know with our more information from you. Did you upgrade from 12.04 or from 13.10? How did you go about working around the upgrade failure? Accepted apt into saucy-proposed. The package will build now and be available at http://launchpad.net/ubuntu/+source/apt/0.9.9.1~ubuntu3.3 in a few hours, and then in the -proposed repository. @Brian - I updated from 13.10. All I did to recover was wait for the aborted upgrade to complete or recover, and rebooted my system, and it claims to be running 14.04 now. The only thing that seemed potentially funny was a message, "error: diskfilter writes are not supported" when I booted it. Someone (I think in one of the duplicate bugs) mentioned that rebooting was successful on both 32-bit and 64-bit processors. @Adam - would love to test it but I no longer have a Saucy system to test it on unless I need to restore from backup, which I'm hoping isn't necessary. @Adam, I'm installing Saucy now - will follow up ASAP. @Jim, be sure to check and see what kernel you're now running via uname -r as I did in comment #4. As best I recall I seemed to be able to recover simply by running update-grub and apt-get -f install (and following suggestions provided by -f install), possibly a few times until things appeared to resolve. But I was using a test installation that was long since erased. Then disabled proposed, refreshed the cache using update-manager and was offered the upgrade via GUI so I proceeded and all went perfectly so I'm marking this verification-done. This was never fixed in Trusty and has manifested itself as bug 1497688 when upgrading to Vivid. The test case for fixing this exists in the other bug. Accepted apt into trusty-proposed. The package will build now and be available at https://launchpad.net/ubuntu/+source/apt/1.0.1ubuntu2.11 in a few hours, and then in the -proposed repository. Verification done via the other bug report.